Corfu kumquat. The trademark of Corfu. An oval orange fruit with sweet and slightly acidic taste. 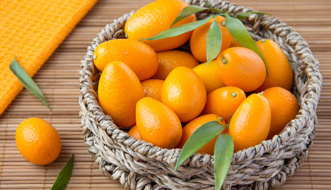 Kumquat is a citrus tree, with origins in China and Japan, which is grown extensively for almost a century in Corfu. Production kumquat in Corfu reaches 100 tons per year. The kumquat is usually not eaten raw, but is used for producing fine liqueurs, wonderful jams and sweets. Generally is exploited in the best way as in baking, cooking and in cosmetics and toiletries. In this category you can find all products of Corfu that have as ingredient the kumquat. Select and we commit ourselves to send a "piece of Corfu `on your doorstep. Corfu is an island known worldwide for its top quality olive oil. There are over 4 million olive trees on the island, some of which are 500 years old! During the era of the Italian (Venetian ) presence, the residents of Corfu Island were paid for planting and grow trees and replace the old ones with new trees, which would by far improve the image of the island. Because of this, oil production on Corfu island prospered and became famous all over Greece. In this section you can find extra virgin olive oil from Corfu, virgin olive oil, olive oil enriched with aromas of herbs and organic oils, most of them derived with mechanical methods and cold pressed. Since the times of Homer and the Odyssey, Corfu has been famous for its wine. Since ancient Greek times, Corfu wineries continued to produce excellent wine varieties up to date. There are several local varieties that have survived such as kakotrygis (white), the Petrokorytho and Skopelitiko (red). 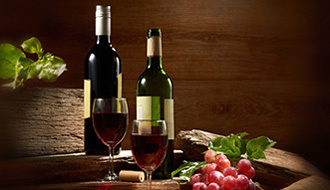 We offer a large variety of wines produced by wineries in Corfu. Make sure to try the wines labelled with PGI Kerkyra (Corfu Regional Wine) and PGI Halikouna (PGI = Protecting Geographical Indication), as well as the favourite wine of James Bond in the film "For Your Eyes Only"! that is produced from grapes Robola and kakotrygis. Ouzo is an alcoholic beverage produced and widely consumed in Greece. It is said that the drink is produced in the same way as in ancient times. Ouzo is a mixture of ethanol (alcohol) water and various aromatic herbs (coriander, fennel, star anise, Portulaca grandiflora, angelica root, etc.) led by the simple anise. Liqueur is a drink made ​​from the alcohol distillation by adding fruit aroma, cream, herbs, spices, flowers or nuts and offered for sale after adding sugar or other sweeteners (such as fructose corn syrup) In e-corfu.gr you will find a wide variety of Liqueurs from Corfu. 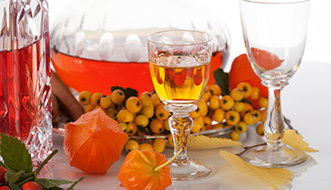 The Kumquat Liqueur is very popular and is exclusively produced in Corfu, while there are also other Corfiot Liqueurs produced by Bergamot, Medlar, Walnut, Cherry, Myrta and many other fruits and herbs. During the English presence in Corfu the English nobles enjoyed their favourite drink with ginger, tsitsimbira, (ginger - beer). A British recipe is used by Christopher Cheimarios and his family in order to produce ginger beer since 1920. 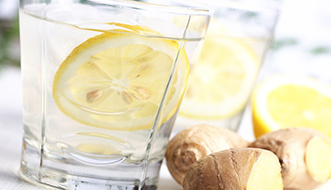 It consists of ginger - highly beneficial for the body - fresh lemon, sugar and water. No preservatives are used during its preparation, while not carbonate is added even though it foams. It is a spicy and stimulating drink with lemon flavour. Maturation is completed in the bottle where the beverage gets its authentic taste. So be careful not to shake immediately before opening and do not leave it in a warm place because ....it Explodes! Keep it in the refrigerator. The olive tree is a tree that exists and grows in the Middle East region and across the Mediterranean all over Greece. Corfu is full of olive trees. Olive oil is linked to the Mediterranean Diet and the variety of Corfu olive (Lianolia) is an integral part of Greek diet. 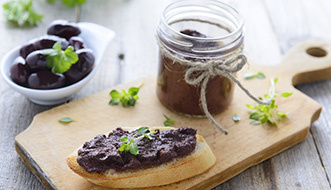 You can choose Lianolia or olives from other areas of Greece which are flavored and processed in Corfu, as well as olive pate to accompany salads and meals. Unique Gift baskets from Corfu. 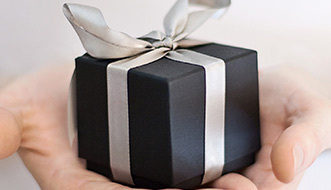 Notable options for corporate gifts. 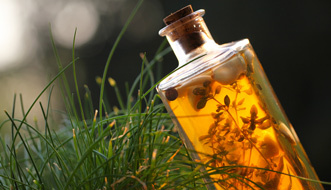 A wide variety of bee products from Corfu is offered by e-Corfu.gr like honey, organic honey, pollen, Royal Jelly, etc. 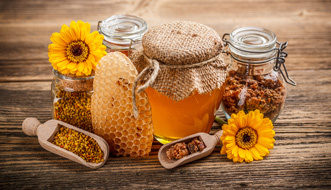 As honey is the key component of the Mediterranean diet, beekeeping in Corfu is flourishing and produces quality bee products that are successfully comparable to similar products worldwide. Participation in worldwide competitions gave awards to Greek producers from Corfu. Enjoy them! 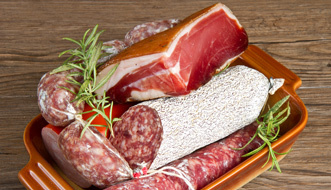 Cold cuts in Corfu are prepared with traditional recipes from Corfu while using the best materials in the market. Modern machinery methods of quality assurance (haccp) are used and they are considered necessary to produce these traditional sausages from Corfu which are characterized by distinctive taste and aroma. Noumboulo,Foumikado (prosciutto of Corfu) and Salado (salami of Corfu) are the exclusive cold cuts of Corfu that you must try! Salami of Corfu, Sausages of Corfu, Smoked Pancetta of Corfu and Prosciutto of Corfu make up a mixed cold cuts plate from Corfu. Accompany them with fresh frozen Corfu Beer, one of the best Greek products! Start your day with a delicious breakfast with the flavour and taste of Corfu. Accompany your coffee, tea or juice with bread, butter and jam from Corfu. Prepare several desserts, such as tarts, cheesecakes, muffins, cookies and more, using jam filling from Corfu in different flavours. These are made from natural ingredients, traditional homemade recipes without using added preservatives. 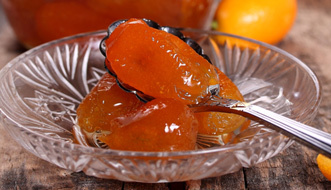 The most characteristic jams are kumquat, bergamot, orange and bitter orange while apple jam, plum, pear, fresh figs and berries are most exquisite tastes found in Greek nature and in especially in Corfu. Famous delicacies of Corfu made with quality materials from Corfu, tradition and love. Unchangeable products in time such as as mandolato and mandoles, sweets and pasteli of various flavours, candied kumquat and "sykomaida" [=Fig pie] and bergamot. New products based on raw ingredients from Corfu and `hidden` recipes are there to amaze you. Wild Myrtos, pomegranate, lime, quince and fig combine perfectly with ginger, carrot and lavender creating incredible combinations for you to taste. 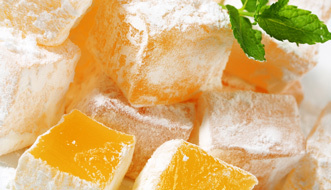 Spoon sweets are a typical example of traditional Greek products. So in Corfu, using quality fruit produced in Corfu as well as recipes with "roots" in the past, sweets rich in aroma and flavour are manufactured and marketed. Kumquat, lemon, bergamot of Corfu, quince, orange and lime are some of the flavours of traditional spoon sweets from Corfu that we offer. The sweets are prepared with fresh and often organic fruits and do not contain added preservatives. Rich flavors, special combinations, pure igredients and `secret` recipes of Corfu. Are they considered Gourmet or Rustic? It`s up to you to decide. The truth is that we refer to handmade products from Corfu, prepared from raw ingredients, from small producers of Corfu, using natural or biological farming procedures. Sundried tomatoes, pate from Corfu, onions and peppers combined with ladotyri (goat oil cheese), herbs from Corfu or kumquats. Chatneys figs, apples, kiwi, pears and kumquat. Goat Ladotyri (goat oil cheese) and Mustard from Corfu. 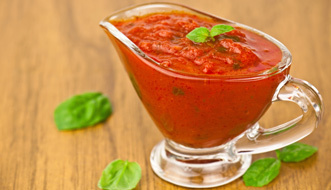 A small amount of them boosts sauces, meals or desserts. You really have to try them out! Flavored Vinegar from Corfu made not just from wine but also from fruits such as, pomegranate vinegar, vinegar wild myrtle, citrus fruits vinegar and even prickly pear vinegar. You can add them to salads or meals and they will add acidity and rich flavor to your dishes. Add new flavors of Corfu and nutritional value in your daily diet. Flour + Water + Egg (not always) = pasta! 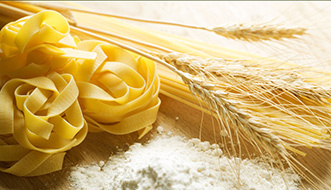 Pasta is one of the most popular foods worldwide and in Corfu as well, because of the Italian influences. Pasta first appeared in ancient Greece, and it was a square sheet of dough with the name lasanon (later lasagne). Corfu produced pure pasta, without adding dyes and preservatives using natural methods of colouring (green - spinach, orange - carrot). Select the type of Corfu pasta you prefer and combine them with sauces made in Corfu or pates of Corfu. Homer described the olive tree as sacred. Odysseus made ​​the bridal bed from olive wood and Polyphemus manufactured his bat. Wood and olive roots of Corfu are being handled skillfully, with passion and patience in order to take form. Plenty in nature, Corfu`s olive wood, is aged for several years so it can be processed and formatted. The results of this process are presented in this category. 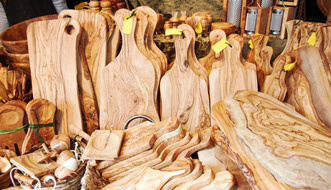 Handmade household items and jewelry of olive wood from Corfu. Certified Organic products are produced and manufactured in Corfu. They are undeniably very important as food choice as the benefits for the health of consumers are obvious. But the contribution of Corfu manufacturers of these products is also obvious in relation to the management of natural resources of Corfu Island and the protection of the environment. They cultivate Corfu land with natural methods and organic supplies without toxic pesticides and chemical fertilizers. The fruits of the effect of organic farming in Corfu are the raw ingredients of our organic products. Rich aromas, and pure flavors of Corfu with large amounts of proteins, mineral salts, enzymes and vitamins. They contain no preservatives, flavor enhancers, artificial colors and fragrances. Strict checks are carried out at all stages, from production through to consumption, so our Organic products of Corfu carry the appropriate CE certification of organic products. A Website full of aromas & flavours of Corfu! Welcome to e-corfu.gr. In the most complete online store with Greek products of Corfu. Choose from a grand selection of products the ones that fit your preferences and do not forget to give yourself a chance to explore new flavours. We, in collaboration with producers from Corfu, care about the quality of these products, as well as, for their delivery to your doorstep, anywhere in the world. 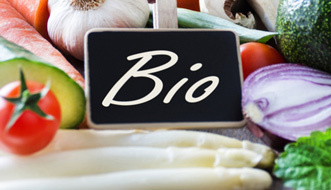 Travel to the gastronomical tradition of Corfu, Greece; discover products made from pure raw materials, as well as, organic and biological products based on preparation methods that have origins in the past and modern combinations of flavours and aromas. Corfu is known in the field of gastronomy to produce unique products such as Kumquat (marmalades, jams , greek spoon sweets and liqueurs), ginger beer and cold cuts called Noumboulo and Salado. 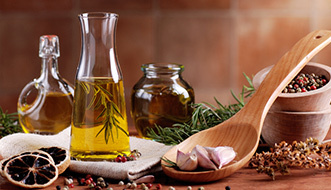 Of course Corfu, being part of the Mediterranean, could not be missing from the table greek olive oil, olive products, wine and vinegar, which are essential components of the Mediterranean diet. Since the ancient times the Phaeacians were well known for their wine, as this is mentioned by Homer in Odyssey, whereas since the venetian era up until today the residents of Corfu produce nutrient-rich oil from "Lianolia", which is well known for its beneficial qualities for the body. Choose Greek pasta, made in Corfu, accompany it with special sauces and pates and enhance even more its flavour and aroma, by adding "Spetsieri " – which is a blend of herbs and spices. 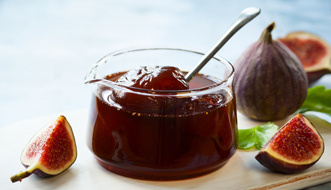 Complete the meal with desserts, honey, jams and spoon sweets. Revitalize and protect yourself by using cosmetics and care products which are based on olive oil, honey or kumquat that are made with pure natural ingredients with no additives. Folk art sculptures made of olive wood, ceramics and books compose the puzzle of our products.